Asma Jahangir was an advocate of the Supreme Court of Pakistan and was been twice elected as Chairperson of Human Rights Commission of Pakistan (HRCP) which was set up in 1986. She was also one of the Directors of AGHS Legal Aid Cell, established in 1980, providing free legal assistance to the needy. Asma Jahangir was instrumental in the formation of Punjab Women Lawyers Association (PWLA) in 1980 and Women Action Forum (WAF) in 1985. In 1998 she was appointed United Nations Special Rapporteur on Extrajudicial, Summary or arbitrary execution of the Commission on Human Rights. From 2004 to 2010, she served as United Nations Special Rapporteur on Freedom of Religion or belief of the Council on Human Rights. Dr. Jahangir was put under house arrest and later imprisoned for participating in the movement for the restoration of political and fundamental rights during the military regime in 1983 and 2007. She was one of the leading figures in the campaign waged by the women activists against the promulgation of the controversial Hadood Ordinances and draft law on evidence. Asma represented several clients who were denied their fundamental rights. Notable amongst them are the cases she fought for brick kiln workers, who are mostly bonded laborers in Pakistan. She was subsequently successful in getting a legislation passed through the parliament in favor of bonded workers. She has defended cases of discrimination against religious minorities, women and children. She defended three Christians, one among them a fourteen-year-old boy, accused of blasphemy. In her effort to secure justice for the disadvantaged groups she was been frequently threatened by militant groups. In 1995, the militants of a religious outfit attempted to murder Asma Jahangir and her family. She authored two books: Divine Sanction? The Hadood Ordinance 1988 and Child Prisoners of Pakistan. There are five papers to her credit. Child Labour, Bonded Labour and Slavery; Women, Tradition and Religion; The independence of Judiciary and Lawyers; Women’s Movement in Pakistan; Strategies for Human Rights and Electoral Process in Pakistan. 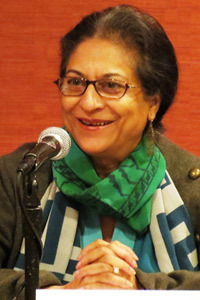 Asma Jahangir was conferred honorary degrees of Doctor of Law by University of St. Gallen, Switzerland, Queen’s University, Kingston Canada, and Amherst College, USA. She was a recipient of number of international and national awards, among which the Ramon Magsaysay award in 1995. Asma Jahangir passed away in Lahore on 11 February 2018.